I’ll be posting a few gift guides this week in honor of Black Friday + Cyber Monday. I thought I’d start with a Gift Guide for the Foodie + Hostess since Thanksgiving is just a few days away (Hoooooray for my favorite holiday of the year!) Gimme all the stretchy pants and mashed taters. This is by FAR my favorite gift guide to put together! Gahhhh! I obsess over things like this on the daily, so trying to narrow it down to my faves was quite an ordeal. These items are from all the different stores where I get my foodie finds. Some of these are things I already own and others are on my Wish List. HINT HINT Santa! This would be an adorable hostess gift or a gift for someone who loooooves some cheese. The knife that comes with it is so cute and perfect for all different kinds of cheesy wonders. I love me a good cheese board. I discovered this shop (Open Door Shop) a while back and tried visiting during our vacation to Charleston this summer. They were actually out-of-town that whole week, so I never got to go inside! Jon Boy was happy because that meant the credit card stayed safely in his wallet, but I was slightly devastated. They have tons of unique pieces that are timeless and simply gorgeous! These are gorgeous and would make a perfect hostess gift or stocking stuffer. I love me some good olive oil. I have a few in my pantry at the moment (green chile + truffle to name a few). Specialty oils and the aged balsamic vinegar in this set would be perfect for your foodie friend or family. These are fantastic for making soups [and tons of other things, but my coffee hasn’t kicked in to go into detail]. Instead of having to transfer hot soup into a blender to get that texture you want, you just plop one of these bad babies into the pot, hit a button, and let ‘er rip. 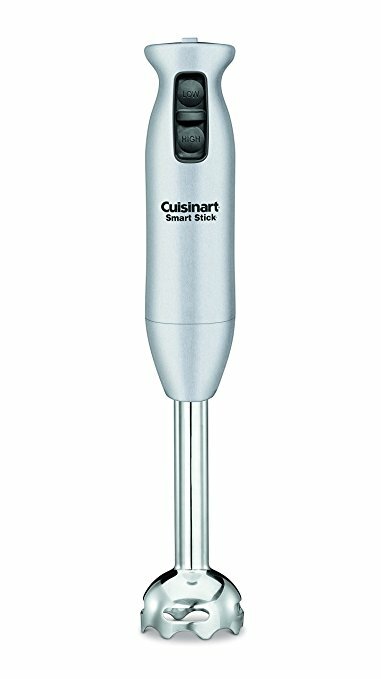 I actually have a Cuisinart one from 2010 when my dad was diagnosed with colon cancer. He had to have a colostomy bag which meant his foods had to be puréed for a while, hence the need for one of these fellas. It still works perfectly, and I’ve actually used it twice in the past week if that tells you how handy they are. They don’t make a mess when blending because the blending mechanism goes to the bottom of the pot (no splashing/food everywhere moments). The actual part that goes in the soup and gets dirty is dishwasher safe, too! I talk about these all the time in my recipes, and I won’t tell you how many I own. It’s slightly embarrassing. I’ve hidden them strategically so Jon Boy has no clue about my obsession. I use them almost daily in place of regular skillets because they transfer heat better, so you get a much more even cooking temperature. They’re also great for developing the fond (yummy brown stuff) that’s left behind after sautéing or browning things. They also transfer straight to the oven, so no more “let me pour this into the casserole dish hoping not to spill it everywhere and in the process burn myself” moves. Just throw ‘er into the cooking cave. I’ve owned 3 Lodge Dutch ovens, and they’ve all lasted at least 5 years. A Le Creuset is a major family heirloom type gift, but they will last you a lifetime if you love them well. Le Creuset 7-1/4-Quart Dutch Oven ($368) – comes in tons of colors! ONE: They don’t scratch the bottom of your pans. Particularly the lovelies above. TWO: They scrape up the FOND (pretty brown flavor bits) at the bottom of your pan better than silicone or metal utensils. THREE: Because Mario Batali said so one time on The Chew, so that means it’s gospel, folks. Any questions? But really, wooden spoons are the way to go. Worth every penny and every bit of hand washing. They’ll also last you a lifetime if you love them well. This is usually the way I ‘mince’ my garlic when I’m cooking. 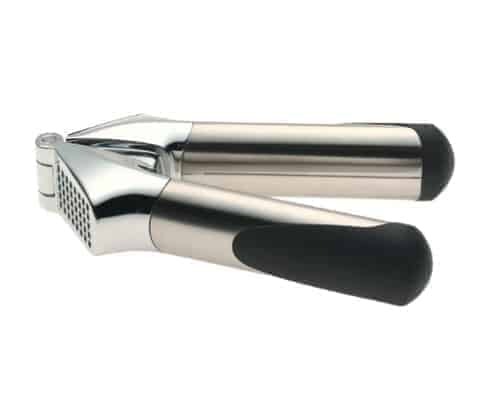 You just smash your garlic clove with a knife or the edge of this fella, take off the paper, and then press it through the holes of this magnificent invention. The garlic ends up as minced [pressed] as it can get, so you don’t end up with chunks of garlic. This little gem is dishwasher safe and would be an adorable stocking stuffer. I got this as a gift yearrrrrrrrs ago, and I absolutely love it! I just fill it with Kosher salt every so often and then my salt is ready-to-go in a safe [but still cute] storage container. The lid slides on-and-off easily but keeps the salt well sealed. For those folks who live in Houston, you know that salt can go ‘bad’ easily because of the humidity (i.e. it clumps). That won’t happen with this little fella. 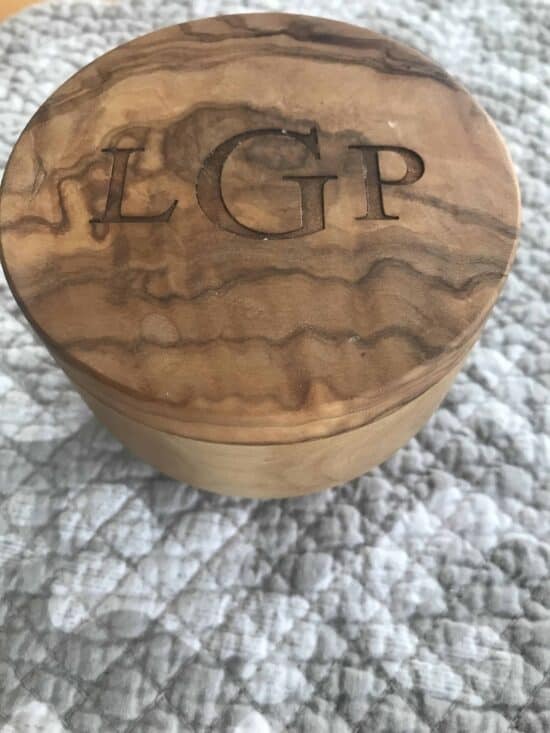 you can also get it monogrammed like mine (see below). Here’s my pretty little lady. Ain’t she cute? I can’t even, Chip + Jo. I can’t. You’ve gotten me. And now you’re at TARGET?! I narrowly escape the other day with just two of their items, but I really, like REALLY want some of these goblets. How stinkin’ cute? These would be a great gift for newlyweds, college kids, or anyone who loves a good goblet. 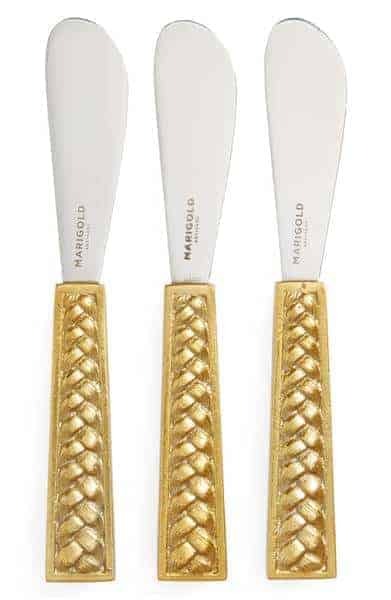 The etching makes them perfect for a holiday tablescape, too. These are hands down the BEST dish towels I’ve ever had. The price isn’t so bad for the quality you get. I’m pretty rough on my little dish towels (sorry, fellas), and these have lasted me for over two years with no signs of stopping. They come in tons of colors, too! 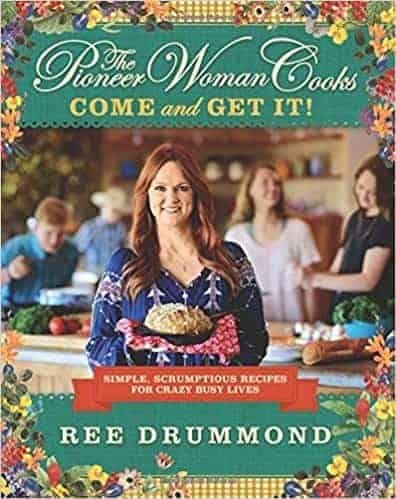 I don’t know if I’ve mentioned it, but I LOOOOOVE Pioneer Woman. She’s my BFF, in case you didn’t know. Her cookbooks are perfect for all cooking levels of expertise. She explains things perfectly and her recipes always turn out fantastic. Plus, this cookbook in particular has recipes that take 20 minutes, 30 minutes, or for those that take even longer. There’s a ton to look at because her pictures are just gorgeous! This little gem is full of delicious recipes made for your Crock Pot or Slow Cooker or, as I like to say, My Favorite Friend on Wednesdays (HELLOOOOO Crock Pot Wednesdays!). The author is a James Beard Award winning cookbook author, and there’s a recipe for slow cooker MAC AND CHEESE, y’all. Winner, Winner, Crock Pot Dinner. Here are some other favorite cookbooks of mine: CLICK HERE. It may be called a ‘tablet’ holder, but it would also be great for cookbooks for those of us who are a little old fashioned like that. I love the rope accent with the white stripe. The monogram makes it even better! What are some of YOUR favorite foodie gifts? I LOVE that idea! It’s something that’s unique, personal, and not something you’d buy for yourself. Love, love, love it!